Flu and fever are commonly mistaken for one and the same thing, and the terms are often used interchangeably by the common man. However, both are two completely different conditions. Let us get to know them properly. Flu – What Is It? Flu, short for influenza, is a viral infection that affects humans, birds, and animals. It is caused by influenza virus that specifically targets the respiratory system of humans, animals, and birds. The influenza RNA virus is of three types – A, B, and C.
Flu is highly contagious. The virus usually spreads through the air. When a person coughs or sneezes, he inadvertently disperses the virus in the air which can infect people in the immediate vicinity. Small children, infants, elderly, and people with compromised immunity are most vulnerable to this virus. The virus can also spread through contact with infected surfaces like staircase railings, table tops, door knobs, etc. The symptoms vary from person to person and can be mild or severe. The disease is self-limiting. The person usually recovers within a week. However, a person with flu can go on to develop complications like viral pneumonia, bacterial pneumonia, and sinus infections, etc. Those with asthma or other respiratory conditions may find their symptoms worsening after a flu attack. Symptoms of flu include high fever (100-103 ºF), chills, body aches, myalgia, extreme fatigue, headache, and coughing. Children may show additional symptoms like nausea, vomiting, and diarrhea. Most of the symptoms resolve within a week, but a cough may last longer than two weeks. The symptoms develop around two days after an exposure to the virus. 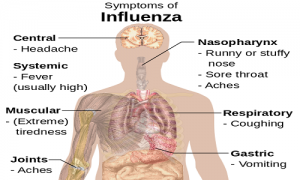 Influenza or flu can occur as isolated cases or as an epidemic or pandemic when caused by a more evolved strain of virus against which the human population has little or no immunity. Influenza attacks can be prevented by administering a WHO-approved anti-influenza vaccine every year. Since the virus can mutate, the vaccine has to be taken every year. Fever is an abnormally high body temperature that is accompanied by shivering, headache, and also delirium in severe cases. It is also known as “pyrexia.” When a person gets a fever, it indicates that the body is fighting an infection. The body’s immune system is battling a foreign invader. The body temperature rises from 98.6ºF to 100.4º F and above. Fever by itself is not dangerous, but when the high temperature is accompanied by cough, cold, seizures, drowsiness, or delirium, it requires immediate medical attention. If the fever lasts more than a day in children and more than 48 hours in adults, the patient should be rushed to the emergency room. In this case, the body is unable to control the rising body temperature. This usually happens in heat stroke or as adverse effects of certain medications. Fever is a common symptom during a viral (influenza), bacterial (typhoid), and parasitic (malaria) infections. The pattern and time of onset of fever can help to reach a provisional diagnosis of the condition. A hospitalized patient with fever indicates that he may be suffering from septicemia. Fever is an important symptom that warrants investigations, especially blood tests which help to reveal the underlying cause. Fever can be combated by taking antipyretic medications along with the specific antiviral or antibiotic drugs. To summarize, flu is a viral infection, whereas fever is a symptom of some underlying disease. Maitreyi Naigaonkar. "Difference Between Flu and Fever." DifferenceBetween.net. August 29, 2017 < http://www.differencebetween.net/science/health/difference-between-flu-and-fever/ >.